People can now explore the Martian surface using Microsoft’s virtual reality headset in NASA’s “Destination: Mars” exhibit. There’s no better person to help launch a virtual reality, interplanetary-themed exhibit than by a moon-walker himself. Former astronaut and moon-walker from Apollo 11, Buzz Aldrin, helped open the new Kennedy Space Center Visitor Complex’s “Destination: Mars” virtual reality exhibit. 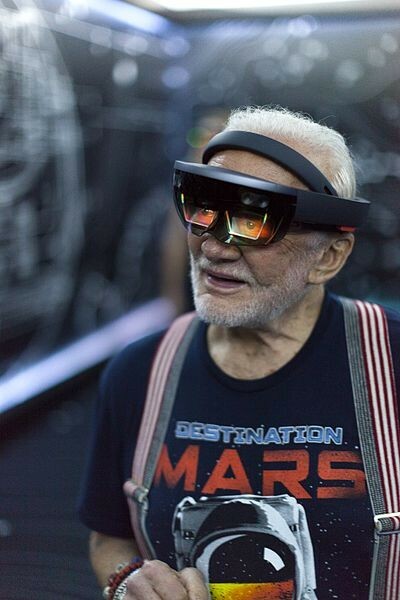 Last Sept. 18, a media preview was led by former astronaut Buzz Aldrin to introduce the “Destination: Mars” virtual reality tour of the red planet. The moon-walker guided the visitors as they traverse through the Martian surface through virtual reality. “This experience lets the public explore Mars in an entirely new way. To walk through the exact landscape that Curiosity is roving across puts its achievements and discoveries into beautiful context,” Doug Ellison, visualization producer at NASA’s Jet Propulsion Laboratory, said in astatement. “Destination: Mars” is also an adaptation of a project called “OnSight,” a Mars rover mission tool developed by Microsoft and NASA’s Jet Propulsion Laboratory. OnSight uses holographic computing that enables scientists to work virtually on Mars. Aldrin also took the opportunity to campaign for NASA so that the agency may gain support from the next administration. This he did so that mankind may be able to “call two planets, home,” Aldrin said during the media preview. The moon-walker is an avid Mars colonization advocate who published his own book in 2013 called “Mission to Mars: My Vision for Space Exploration.” However, Aldrin and experts believe that it will take time before that happens. So while waiting for the actual Mars colonization, students, scientists and the public can wonder on the Martian surface by using virtual reality during the exhibit. NASA’s Jet Propulsion Laboratory, in partnership with Microsoft, developed the exhibit. By using the images taken by the NASA’s Mars Curiosity Rover, visitors can explore certain regions on Mars during the event that will be open to everyone until Jan. 1, 2017.